The Overview tab of your Brand Monitoring campaign will show you your campaign’s overall progress in a series of charts and graphs. From here you can get a quick overall sense of your campaign and also jump into the deeper reports within the tool with the corresponding tabs. The numbers you see at the top (Total Mentions, Positive Mentions, Mentions with Backlink, etc) are all based on the date range set at the top of this page. All of your settings are available to edit from this tab, and you can add a campaign (up to 3 campaigns per Project). In the Sentiment chart you’ll be able to quickly see how positively the brand name you’re tracking is being discussed online - if it’s mostly green, your brand is beloved, but if there’s a lot of red - you may need to manage your online reputation better. 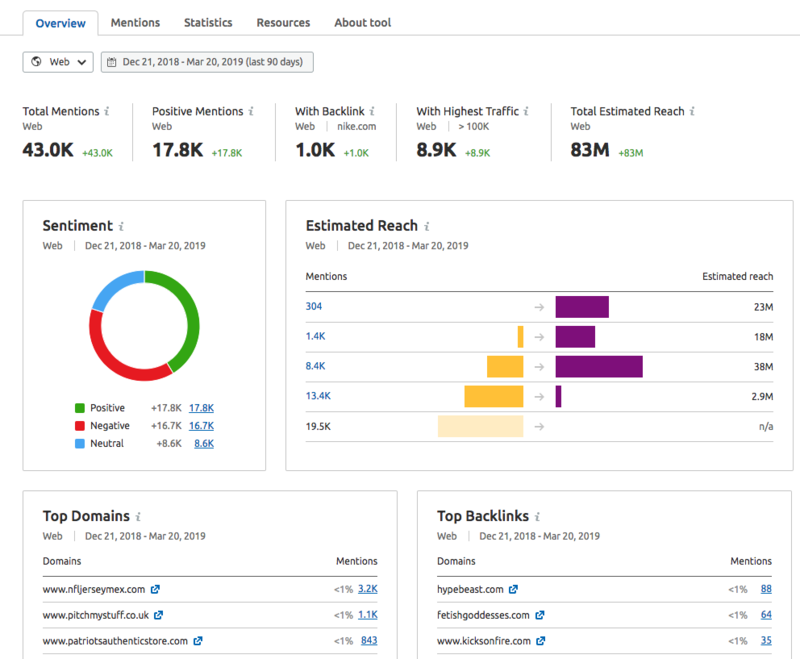 The Estimated Reach chart will tell you if you are mainly getting mentions that are reaching a ton of people or if most of your mentions are in the lower reach category. Top Domains: These are the top domains ranked by the number of times they mentioned your branded word in the set time period. Click on the number to view a filtered Mentions report with all mentions from the specific domain. Click “view full report” to view the complete list in the Statistics tab. Top Backlinks: These are the top websites that are linking to your domain with mentions of your branded word. Click on the number to view a filtered Mentions report with all of the mentions from the specific domain that contain a backlink to your domain. 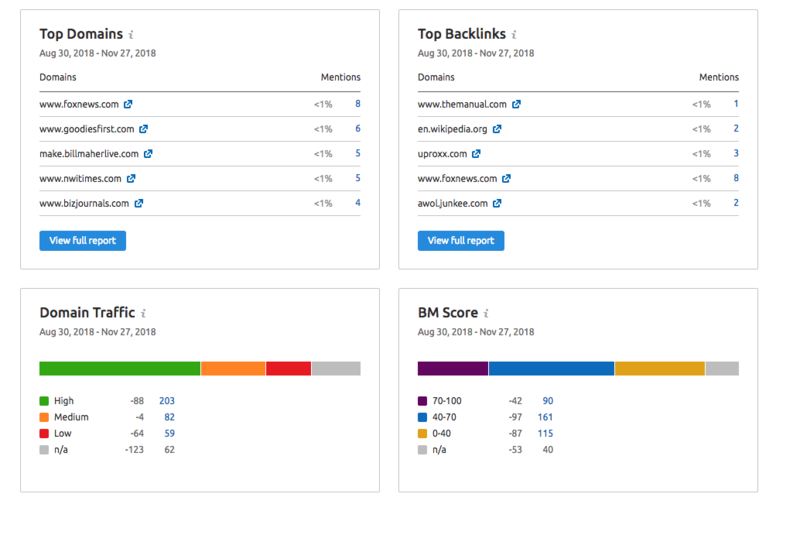 Click “view full report” to view the backlinks report under the Statistics tab and see the rest of the backlinks SEMrush found associated with your mentions. Domain Traffic: This illustrates the proportion of high-traffic, medium-traffic, and low-traffic domains that mention your branded word. Click on one of the numbers to open the mentions feed with an automatic filter for that traffic bracket. BM Score: the number of mentions in varying brackets of BM scores. The higher the score, the more valuable the mention is. Click on one of the numbers to open the mentions feed with an automatic filter for that BM score range. You can also search for mentions by Web, Forums, and Instagram. To do this simply hit the dropdown menu next to the date and select which source you want to search from. By selecting forums you will also change the data that is displayed on the overview page. It will now only show total mentions, positive mentions, mentions with backlinks, sentiment, top domains, and top backlinks. Mentions - the complete feed of your mentions with various filtering and sorting options. Change your view to look at all web mentions or just mentions on Twitter. Statistics - Analyze the top domains mentioning your branded keyword as well as the domains that are giving your website backlinks in addition to mentions. Resources - Track domains that are mentioning you or domains that you want to acquire mentions from. What makes Brand Monitoring different from Google Mention, Talkwalker, Brand Alerts, etc? What Are “Words To Search In Mentions For Your Keyword”? How Many Keywords Can I Track With The Brand Monitoring Tool? What can I export from the Brand Monitoring Tool? How do I add keywords to an existing Brand Monitoring campaign? How Can I Track Mentions on a Specific Domain?